Unbreakable Kimmy Schmidt has had a long trek to make it to the small screen, but today Netflix has given us a first look at the new series from Tina Fey and Robert Carlock. If you know anything about the project, it’s about as wacky as you’d expect. If you don’t, go ahead and give the first Unbreakable Kimmy Schmidt trailer a watch, below. As you can see, Unbreakable Kimmy Schmidt follows Ellie Kemper as Kimmy, a woman who escapes an underground cult and realizes the world hasn’t fallen apart as she has been taught. From the trailer, it looks like Kimmy realizes the whole world is in front of her and seizes the moment, moving to New York City. It’s a little Breaking Amish, but Kemper’s so insanely enthusiastic in the trailer, it would be difficult to not give this one at least one shot. Just look at the face of this lead character. She's kooky and I love it. So, what do you do when you escape a doomsday cult hidden underground in the state of Indiana? You move into a tiny shoebox apartment, you eat candy for breakfast, and you go dancing, in that order. At least, that’s what Unbreakable Kimmy Schmidt would like us to believe. But beyond the goofy setup and easy gags, the Kimmy Schmidt-focused story looks to be a charmer, full of growth from an individual whose options were once limited but who no longer sees onstacles in the life before her. I’m a little sad that NBC didn’t see this weirdness fitting into its lineup. The network was the original producer of the series and even gave Unbreakable Kimmy Schmidt a 13-episode series order, but the show never saw the light of day last TV season. Instead, NBC sold the show to Netflix and Unbreakable Kimmy Schmidt got a pretty good deal in the process. Instead of just airing the 13-episode first season, Netflix has actually already ordered a second season of the comedy. So, don’t worry about the project getting canceled—it will definitely be around for round 2. 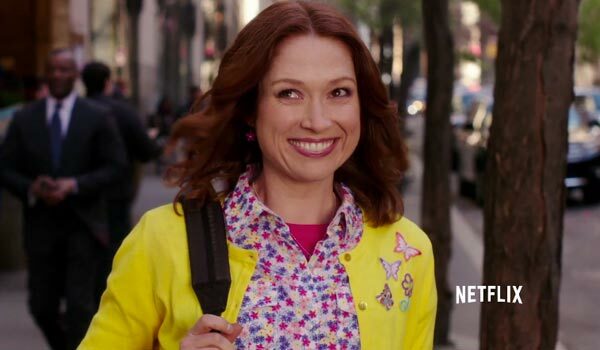 Unbreakable Kimmy Schmidt is only one of several shows that will premiere on Netflix over the next couple of months. The new premiere lineup also includes Bloodline, Grace and Frankie and the Marvel TV series Daredevil. You can find Unbreakable Kimmy Schmidt on Netflix starting on March 6, 2015. The rest of Netflix’s premiere schedule is also available. Network and cable favorites can also be viewed with our 2015 Midseason Premiere Schedule.